Notion Ink Adam: 6 Hour+ Battery Life? Notion Ink CEO Rohan Shravan raised a few eyebrows recently when he claimed that the company’s upcoming Adam tablet would be able to run for 15 hours on a charge, providing better battery life than the Apple iPad, which delivers around 10 hours of average battery time. Today however, he made some clarifications suggesting that he was getting 15 hours the way he was using it, but that it’s physically possible to discharge the battery in just 6 hours if the CPU is utilized at max. For instance, if you crank the screen brightness and volume all the way up and continuously play 1080p video, you’ll probably get 6 hours of battery life. The same goes for playing YouTube videos, streaming 3D Maps over 3G with GPS on, recording and streaming HD video over WiFi, or playing augmented reality 3D games using the camera and a wireless connection. That doesn’t mean you can’t get 15 hours of run time. But Notion Ink isn’t guaranteeing it. To get best results, Shravan says you’ll want to get a machine with a Pixel Qi display, use earphones when possible, keep the brightness and volume down, and so on. Really, what it comes down to is that like a smartphone, your battery life will vary greatly depending on what you’re using it to do. This is true with x86-based laptop computers as well, of course, but to a much lesser degree. 6 to 15 hours is a pretty wide range. 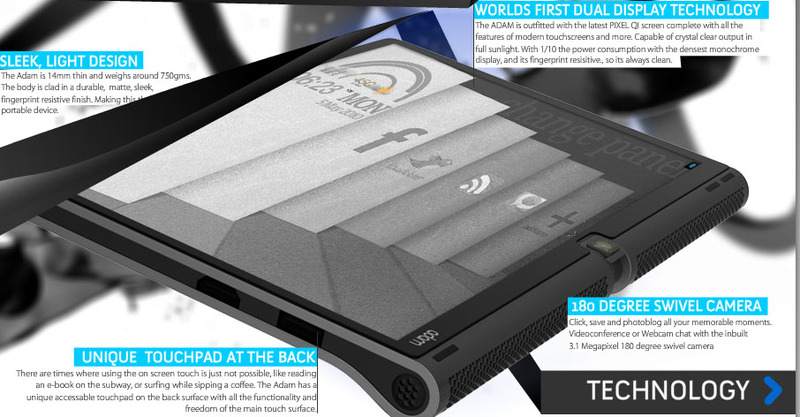 On paper however, odds are in the tablet’s favour; it has a 24Whr battery and a low power NVIDIA Tegra 2 processor. It uses very little energy, even when displaying 3D graphics using OpenGL. And some models of the tablet will be available with a low power Pixel Qi transflective display, which should reduce power consumption even further when you use the device with the backlight turned off. I wrote in the last post that you can easily get 15 hours from the device. My personal use case is different and so will be yours. Blogs world over picked up this line as posted as Adam gives 15 hours. I don’t think that’s the right way to look at it. There can be so many use cases where you can discharge it much faster than your normal use case, so be cautious when you read “Adam claims minimum 15 hours of battery”! There tests are on full display, full volume which is never going to be true. Pixel Qi display is 10 times efficient so a huge drop here, if you use earphones, you get more juice and so on..
Folow this author on Twitter.